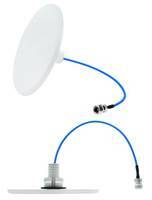 CFSA Series Wideband Antennas are based on passive intermodulation. Providing pattern coverage optimized at 698-960 MHz, and 1350-4000 MHz supporting global GSM, DCS, UMTS, AWS-3, and 3G/4G-LTE/WiMAX frequency bands for indoor requirements, CFSA Series Wideband Antennas are suitable for office and apartment buildings, hotels and airports. Improving in-building wireless telecommunications and offering consistent, reliable Internet connectivity, Antenna radiates indoor signal which is 20% more than DAS antennas. The telecom industry's thinnest, smallest ceiling mounted wideband antenna that is more efficient and meets the design needs of office and apartment buildings, hotels, airports, and other large coverage areas, was announced today by global technology leader Laird (LRD: London). Laird's new CFSA Low Passive Intermodulation (PIM) Ultra-Low profile antenna is just seven millimeters thick, or about the thickness of a smartphone providing an ultra-low profile antenna that provides buildings with an inconspicuous yet high performance antenna for enhanced wireless connectivity. This patent-pending CFSA ceiling mount antenna radiates an indoor signal up to 20 percent more efficiently than other in-building Distributed Antenna System (DAS) antennas on the market today, improving in-building wireless telecommunications and delivering consistent, reliable Internet connectivity, further enabling the Internet of Things (IoT). Industry experts forecast that by 2020, more than 23 billion "things" globally will be connected to the Internet, and about 40 percent of them will be used for business, industrial, healthcare, and other sectors for the Enterprise Internet of Things (EIoT). Furthermore, the majority of EIoT mobile data traffic will be generated indoors at offices, hotels, hospitals, universities, shopping malls, and multi-tenant, multi-use buildings. That rising demand for wireless connectivity requires in-building antennas that can be placed anywhere without being obtrusive, and no other antenna on the market meets the technical and aesthetic requirements better than the new CFSA series from Laird. The new CFSA Series Low PIM Ultra-Low Profile antenna provides pattern coverage optimized for indoor requirements at 698-960 MHz, and 1350-4000 MHz supporting global GSM, DCS, UMTS, AWS-3, and 3G/4G-LTE/WiMAX frequency bands. "Laird's technology enables the in-building wireless world to work," said Scott Lordo, senior vice president of Laird. "Improving indoor wireless coverage and capacity usually requires deployment of more ceiling antennas. But this is at the expense of the in-building design and aesthetics required by network operators and cherished by building tenants and building owners / management firms. Our new CFSA antennas are smaller, more aesthetically pleasing, and deliver next-generation performance for high-quality, in-building connectivity." Go to CFSA Ultra Low Profile for more information https://www.lairdtech.com/products/cfsa69383p-698-9601350-4000-mhz-ultra-low-profile-low-pim-ceiling-mount-antenna. Laird is a global technology company that enables mission-critical mobile connectivity through wireless applications and antenna systems, and components and solutions that protect electronics from electromagnetic interference and heat. Products are supplied to all sectors of the electronics industry including Connected Transport, Connected Industry, Connected Medical, Telecom/ Computing, and Mobile Device markets. Laird, a unit of Laird PLC, employs over 9,000 employees in more than 50 facilities located in 19 countries.